On 18 September 2015, the presentation of His Holiness Patriarch Kirill’s book “A Pastor’s Word. God and Man. History of Salvation” took place at the German College in the Vatican. The book was published in the Italian language by Accademia “Sapientia et Scientia” in collaboration with the Publishing House of the Moscow Patriarchate and the Vatican Publishing House. Presenting the book at the ceremony were Metropolitan Hilarion of Volokolamsk, chairman of the Department for External Church Relations of the Moscow Patriarchate, and Cardinal Gerhard Ludwig Müller, Prefect of the Congregation for the Doctrine of the Faith. The DECR chairman expressed his certainty that the book would find a lively response among the Italian readers, since, initially intended for the Russian audience, it speaks about eternal and universal truths in plain modern language. “Everyone will feel, with what love and care His Holiness addresses our contemporaries,” Metropolitan Hilarion continued. To conclude his speech, the DECR chairman expressed his hope that the presentation of His Holiness Patriarch Kirill’s book in the Vatican would promote dialogue and mutual understanding between the Eastern and the Western Christian traditions. In his address, Cardinal Gerhard Ludwig Müller emphasized the importance of His Holiness Patriarch Kirill’s book for today’s European society. As Cardinal Müller noted, His Holiness’ most significant thought is that love alone can restore unity between Christians. 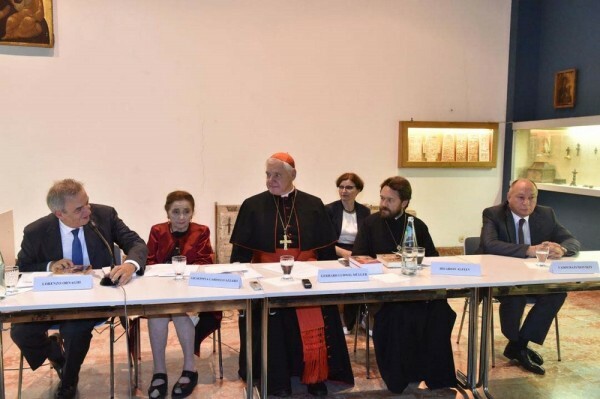 Among those who also spoke at the ceremony were Prof. Giuseppina Cardillo Azzaro, President of theAccademia “Sapientia et Scientia”; Mr. Vadim Razumovsky, Chargé d’Affaires of the Russian Embassy in Vatican; and Prof. Lorenzo Ornaghi, Rector Emeritus of the Catholic University of the Sacred Heart.